It’s been a long time since I had a day trip with my father, so imagine my delight when he suggested that he join us for our excursion to Bird Kingdom in Niagara Falls and play Niagara Families photographer for the day. Ayla (age 8), Noah (18 months), my mom, dad and I took in the sights and sounds of this indoor bird sanctuary, and here’s our review of our day at Bird Kingdom, complete with beautiful photos by my dad, Douglas Skinner. First, I loved the fact that Bird Kingdom has their own parking lot. Downtown in the Falls can be a bit of a parking nightmare. Coming from life in Toronto, $2 parking is a steal! The lot is connected to the Bird Kingdom facilities, and is fully accessible. Accessibility is a prime objective at Bird Kingdom, which was a delight with a sleeping baby in a stroller. Even though both the elevators and escalators were out-of-order on the particular day we went, the staff were accommodating by supplying a detailed map that allowed access to all of the ramps on offer. Bird Kingdom also offers free access to caregivers and a special needs rate. You can find those details here. The entire facility is wheelchair accessible, with the exception of the Javanese Tea House, which is a lovely but not entirely necessary part of the attraction. There was so much to see at Bird Kingdom, that we easily spent two hours there. Our tour was backwards, due to the elevator maintenance, so we began in the Main Aviary, which Bird Kingdom boasts is the world’s largest. It’s a serene, sunny rain forest that hosts 400 spectacular birds. The birds are free to roam the aviary, and they were breathtaking. My mom isn’t a big fan of birds, and I was super impressed that she was up for the adventure. I’m happy to report that all of the birds kept a respectful distance, and mom didn’t freak out even once. Ayla was delighted by all of the natural beauty. She’s a very energetic kid, so Bird Kingdom was a beautiful chance to slow down and find calm energy to experience the birds, and encourage them to be curious about her too. She discovered so many colourful feathered friends hiding in trees, and she was even lucky enough to score a newly shed tail feather from a beautiful blue Macaw. We asked, and the lovely staff let her take it home. She and I fed the lorikeets, which was a crazy experience. These brilliant birds are kept in a large cage, and we walked right in and paid $2 each for a little cup of nectar. From the moment I was in the cage, a curious bird landed on my purse. Once we had our nectar, Ayla and I had about six birds on each of us. Some of them fought over the nectar, but they were all quite gentle. It was thrilling, and she was so excited. We posed for an obligatory photo (they sell these as souvenirs in the gift shop on the way out), and my dad snapped a couple of pics from the outside of the cage. If you have a little one (younger than 8) who wants to experience feeding the birds, I recommend that you hold the nectar, as the birds are about the size of fat robins, and may be a bit overwhelming for very small children. I was a naughty mom and woke Noah from his nap to experience the aviary. I was so glad I did, because he absolutely loved it. From watching the birds, to splashing in a couple of small puddles, to counting the giant koi in the pond, there was no end to the amusing things to do for a young toddler. He explored everything as my parents happily followed, and his sister eagerly led him about. Even he seemed to sense that calm energy was best in the space, and he refrained from his usual delighted screeching. 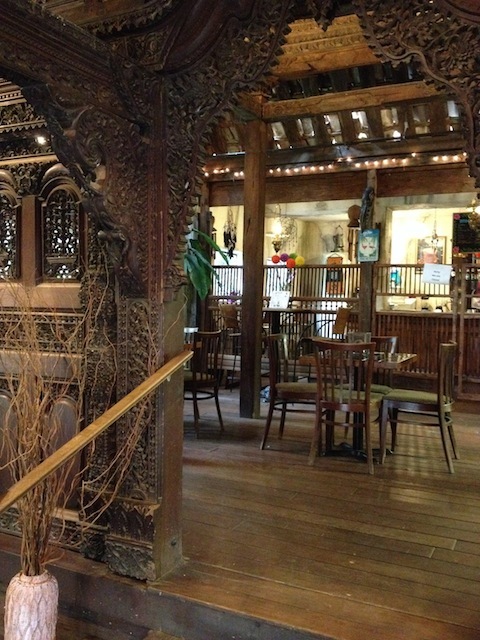 I fell in love with the Javanese Tea House in the Aviary. This magnificent structure is entirely hand-carved and built without nails. It was so very beautiful, and inside is a little snack bar that’s also liquor licensed. A stunning spot for a little rest with the kids (there were some interesting reptile tanks inside) or a truly romantic spot for a cocktail – Bird Kingdom would be a beautiful date night destination! After we walked through the main aviary twice (yes, we all enjoyed it that much!) we moved on to the Night Jungle. This area of the kingdom is very dark and housed the nocturnal creatures found in the rain forest, including several varieties of spiders and lizards and some beautiful little owls. There are also several bats, and you can watch as one of the staff feed the bats behind glass walls. Ayla loves the things that creep and crawl, so she was particularly into this room. There’s also a giant sandbox where the little ones can dig for ancient treasures. Both kids would have stayed here forever, but we had to bail when a little dude started throwing sand into our baby’s face. Yeesh. After the Night Jungle, we wound our way into the Small Aviary. Honestly moms, I could have ditched the kids with the grandparents and spent my entire afternoon in here sipping tea. I honestly didn’t realize how much I love birds. I found it so calming and cheering to just sit and watch them flit from tree to tree, and I loved listening to the many different kinds of bird song. I actually think this place has a therapeutic effect. If you suffer from the winter blues, consider treating yourself to a little afternoon getaway to Bird Kingdom – between the warm, sunny beauty of the oxygen-rich lushness of the Main Aviary and the charm and whimsy of the Small Aviary you’ll leave feeling rejuvenated. Also if it happens to be your birthday, your admission will be free (ID required, and this doesn’t apply to birthday parties booked at Bird Kingdom). The kids continued to be engaged by the Explorer Base Camp, Bird Kingdom’s animal encounter room. This space looks exactly like the name suggests, and there are a host of birds and reptiles that the kids can get up close and personal with, under the careful supervision of the staff. It’s another souvenir photo op, but it’s also a very cool opportunity to handle a snake, or a turtle, or a beautiful exotic bird. Noah was so happy to see real live turtles for the first time, and Ayla held a little bird and a medium sized turtle which were both just her speed. Even the souvenir shop was a hit with me. I usually hate this part of our visit to attractions because I find that these places are usually stocked with cheap touristy junk. Bird Kingdom had a beautiful store with reasonable prices and lots of selection. Each of the kids was able to take home a little memento, courtesy of their grandparents, without breaking the bank. Incidentally, we usually insist that these types of purchases come out of the kids’ allowance, which adds more value to the trip because we work in a lesson about commerce and finances. Ha! Bird Kingdom was a big hit with all of us – kids, mom, and grandparents. They have a well-stocked cafe if you need to incorporate a meal and don’t want to take on the madness of Clifton Hill. We all found interesting and fun things to see and do throughout our visit, and the staff were super friendly and great with the kids. I was impressed to see that Bird Kingdom offers birthday party packages for kids ages 4-15, and I think this would be a big hit with any kid who was into nature and animals, which as far as I can tell includes most kids. This is a must-do if you are visiting the Niagara Region, or if you’re a local looking for some rainy-day fun. Bird Kingdom is open year-round.